While all eyes are fixed on the political and economic crisis in Venezuela, a slow-motion coup is unfolding largely unnoticed in Guatemala. 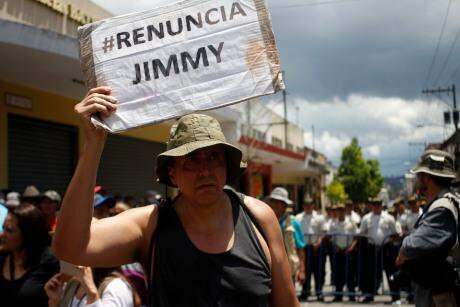 President Jimmy Morales, members of Congress, certain business people and powerful military officers are taking swift, dramatic steps to consolidate power before the presidential elections in June. Morales is not eligible for re-election and so once his successor takes power he will lose his immunity from possible prosecution for corruption. Despite recent progress in holding perpetrators of past crimes accountable, Guatemala has remained notorious for high levels of corruption and the infiltration of organised crime – which includes former military and public security officers—into the highest levels of government. To combat this trend, in 2006 the Guatemalan government and the UN signed an agreement establishing the International Commission against Impunity in Guatemala (CICIG) to support Guatemalan investigators and prosecutors to expose organised crime and corruption. Most recently the CICIG was investigating allegations of electoral finance fraud by Morales, as well as separate corruption cases against his brother and his son. It twice requested that Morales’ immunity be lifted to allow for further investigation and potential prosecution. However, last September 2018 Morales denied CICIG commissioner Ivan Velazquez re-entry into Guatemala. In January he went even further: he unilaterally terminated the agreement with the UN and expelled the rest of the commission’s foreign staff from the country. That left Guatemalan staff in limbo and vulnerable to legal harassment by the administration. The Constitutional Court has attempted to protect the mandate and function of the CICIG, but Morales and his allies have disregarded its rulings. Morales then retaliated against the court by petitioning to have three of its judges stripped of their immunity; he referred this matter to a Congressional Investigative Commission, which is thought likely to support him. Guatemalan human rights advocates see these moves as an attempt to neutralise the two institutions in Guatemala – the CICIG and the Constitutional Court – likely to stand in the way of the emerging consolidation of government power. These moves have paved the way for Congress to push for reforms to the 1996 National Reconciliation Law, developed as part of UN-brokered peace accords following Guatemala’s 36-year civil war. The law currently provides amnesty for political crimes committed during the war, but explicitly denies it for grave internationally recognised crimes including genocide, torture, and crimes against humanity. If Morales and certain members of Congress, widely known as the Pact of the Corrupt, succeed in reforming the National Reconciliation Law, it will provide blanket amnesty for serious human rights crimes. The proposed changes would also annul the convictions of former soldiers and paramilitaries for crimes including torture, ‘disappearance’, execution and aggravated sexual violence. It would release anyone convicted in this way since 1996 – within 24 hours of the law’s promulgation. Those in jail awaiting trial would be released. Human rights activists in Guatemala are profoundly concerned. The law could be amended within days or weeks, and perpetrators could be back on the streets shortly thereafter, free to retaliate against the activists, judges and prosecutors who worked so hard to secure justice for victims of the civil war, as well as target survivors and witnesses who bravely testified against them. In a third move to eliminate opposition and consolidate power, President Morales and his supporters in Congress are now also pushing an ‘NGO law’ through Congress that would give the Ministry of the Interior the power to shut down any organisation that is engaging in activities not expressly described in its incorporation papers, or conducting activities deemed contrary to public law and order – without defining what those might be. This draft law appears headed for adoption soon, at which point it will go to the president, who is certain to support it. Armed with this new legislation, the president and his allies will be able to shut down any organisation that challenges them. If the Constitutional Court is coopted, there will be nothing to stand in the way of the decimation of Guatemala’s civil society. And if the CICIG remains inoperative, Morales and his allies will have set a very dangerous international precedent that undoubtedly would further embolden autocratic and corrupt leaders the world over. The Fund for Global Human Rights, where I work, has worked closely with human rights groups and community activists across Guatemala since 2003 – helping to resource their long-term struggle for justice. We have been proud witnesses to the achievements these activists have made over the years. However, the rapid breakdown of the rule of law threatens their freedom to speak out and even their very lives, and could have grave implications for the entire region and beyond. Despite the efforts of groups like the Fund, other international organisations and dedicated activists on the ground, the crisis unfolding in Guatemala is being met with a deafening silence among the international community. In particular, the United States, once a prime backer and proponent of the CICIG, has abandoned its public commitment to the commission, leaving threatened human rights activists and massacre survivors to fend for themselves. Despite ongoing political noise in the US around a supposed influx of migrants and refugees, almost no attention is being paid to a crisis that threatens to force Guatemalans to flee their country. The international community must unequivocally denounce this slow-motion coup and use foreign assistance and any other available leverage to hold Morales and his government accountable before it is too late.